Our mission is to provide the latest aftermarket accessories ,OEM parts and customizing tools needed to transform your stock Harley Davidson touring motorcycle into the one of a kind Customized HD Bagger ! Why do I ride a Harley? I realize riding a Harley Davidson touring motorcycle is not just riding.It's building friendships, expressing who I am with out having to say a word, attitude and the freedom to take any road I choose ,its my Ultimate Riding Machine. Harley Davidson touring motorcycles has been one of the most popular brands in its segment. 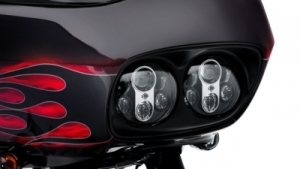 The motorcycle accessory companies and custom bike builders are giving us truly amazing choices. The guys at Harley are definitely offering more unique factory bolt on's. Which touring motorcycle to choose? Before you start customizing you must choose the right bike first. There are four basic types of touring bikes or some times called "dressers". The Road King, Road Glide, Street Glide and the Electra Glides. Each model has several trims to choose from. All Harley touring motorcycles come with saddle bags. 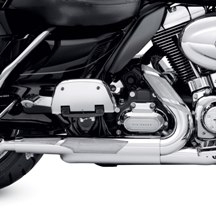 All models come with a factory audio system except the Road King models but it can be added with factory or aftermarket equipment. This site will assist you to make the right choice the first time. 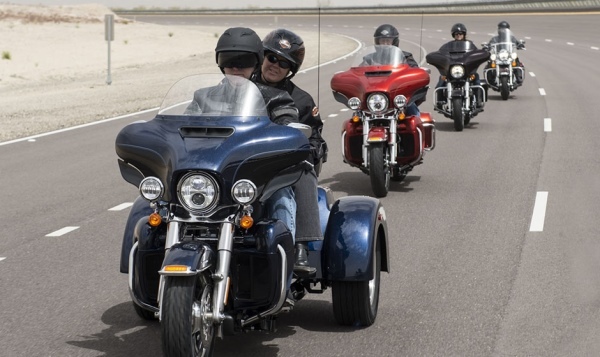 The 2014 Harley Davidsons are here ! 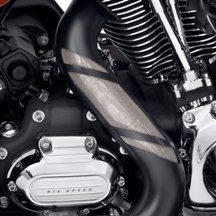 Camtechcustom has a new design for 2000-2012 model Harley Davidson touring motorcycles. 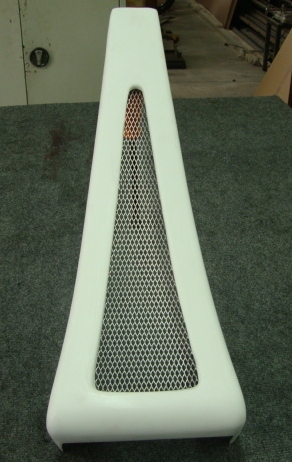 The big mouth chin spoiler as aluminum grill insert and steel monting brackets. 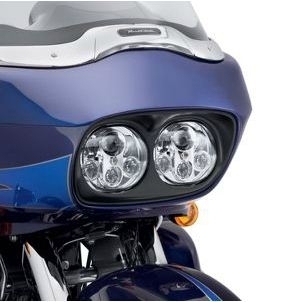 The big mouth chin spoiler will only fit raked bikes with 23 inch to 30 inch wheels. 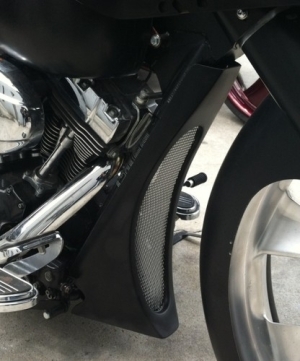 Chamtechcustoms also offer a full length chin spoiler for Harley Davidson touring motorcycles with a factory rake with up to a 21 inch wheel. 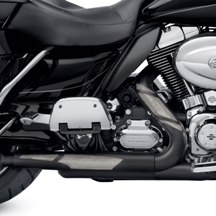 The spoiler will also bolt on to newer touring motorcycles with 103 motors that also have the oil cooler. CustomHDBaggers bagger fact. Did you know with the new Daymakers, if you turn the ignition to the aux position the headlight turns off but the bar and shield stays lit up....cool! This kit replaces the factory exhaust shields with a unique and attention-getting design. The shields feature laser cut openings that are filled with tightly-woven mesh that delivers a modern high performance look. 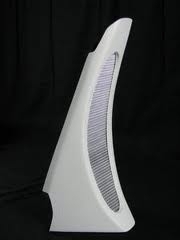 The heat shields are offered in chrome or jet black ceramic. The easy to install kits include front and rear header shield and collector shield. Screamin' Eagle® Laser Exhaust Shield Kit. They retail for 299.99 chrome and 349.00 black ceramic. 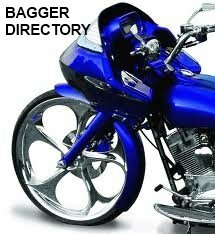 CustomHDBaggers.com has all of the latest bagger videos. The days of searching for your favorite videos are over.You will find the Roadglide, Roadking, Streetglide, Electra Glides and CVO's in their own video library. 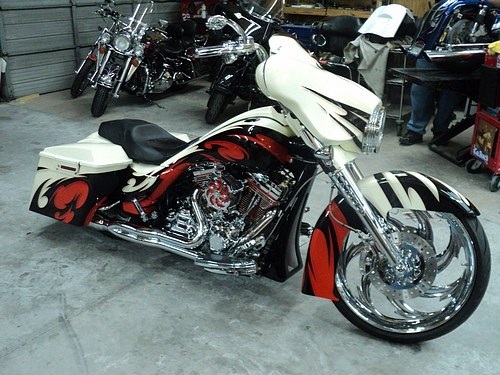 If it has to do with touring motorcycles we will have it from full custom baggers to bolt on OEM parts. We all drool over the masterpieces that are rolling out the doors of our favorite bike builders. Baggernation, Sinister Industries and Fat Baggers,Inc to name a few. The average guy has to answer to bills needing to be paid, college bond kids or some of us may even have a non believer better half (that we love of course) and as a result we can't afford to buy a custom bagger. Luckily for us, several bike builders and aftermarket companies sale items by the part. And so begins the hunt for the perfect bagger accessories. When it comes to customizing your new Harley it can feel like an addiction.We all know the feeling when you've just seen the perfect custom part.You're convinced without it, your bike just doesn't look or ride as well any more. So what's next? We brown paper bag it for weeks and save every dime we can .You know it's the HARLEY FUND! And CustomHDBaggers is were you start. Assorted custom HD Bagger Videos featuring parts and how-to videos. Online directory of the latest Harley Davidson speakers, head units, amplifiers and audio accessories! The only online bagger directory of custom bagger builders! Online directory of Harley Davidson touring motorcycle custom wheel manufactures. The 2013 Harley Davidson Baggers are here and looking good! 2013 Harley Davidson CVO Baggers have arrived. CustomHDBaggers story and how it was started! To ask questions and leave comments.